The Chiefs signed Sammie Coates on Friday, Brooke Pryor of The Kansas City Star reports. Analysis: Coates has found a new home after being released by the Texans in mid-December. While he has some NFL experience under his belt, the Chiefs have plenty of talent in the wide receiver group, so he will have his work cut out for him to latch on to the 53-man roster. Coates worked out for the Cowboys on Friday, Todd Archer of ESPN.com reports. Analysis: Coates was cut by the Texans on Tuesday, and he's wasted no time in searching for a depth role elsewhere in the league. If Coates were to land in Dallas, he'd likely slot in behind Amari Cooper, Michael Gallup, Cole Beasley, Allen Hurns and Tavon Austin (groin). Coates was released by the Texans on Tuesday, Aaron Wilson of the Houston Chronicle reports. Analysis: Coates appeared in 12 games with the Texans this season but caught just one pass on two targets, as he spent of majority of his time on special teams. The 25-year-old Auburn product will look to catch on elsewhere with the 2018 regular season winding down. Coates (illness) is active for Monday's game against the Titans. Analysis: Coates received the questionable tag after being added to the injury report Saturday with an undisclosed illness, but he's apparently good to go Monday. The 24-year-old should serve in his usual role as the Texans' No. 4 wide receiver with DeAndre Hopkins (foot) and Keke Coutee (hamstring) both active. Coates is questionable for Monday's game against the Titans due to an illness. Analysis: Coates was a late addition to the injury report and did not participate at Saturday's practice. The 25-year-old has made only one catch this season and with DeAndre Hopkins and Keke Coutee avoiding injury designations this week, seems unlikely to be significantly involved offensively even if able to play. 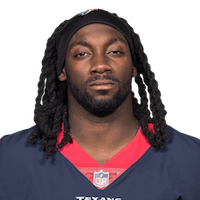 Coates and Vyncint Smith are the in-house options to fill in for the injured Will Fuller (knee) in Week 9 against Denver, Aaron Wilson of the Houston Chronicle reports. Analysis: Coates has served primarily on special teams this season while playing just 35 offensive snaps in 2018. With Keke Coutee (hamstring) uncertain, both Coates and Smith may get increased chances, although we expect a heavy reliance on Houston's ground attack, which has averaged nearly 165 yards over the last two games, or a search on the trade market for wideout help. Coates (hamstring) was a limited participant in Friday's practice but does not have an injury designation for Sunday's game against the Cowboys. Analysis: It looks like Coates' limited participation in practice this week was all precautionary, as the wide receiver will not be on the Texans' injury report heading into the weekend. Expect Coates to suit up and be a full go against Dallas on Sunday. Coates was limited in Wednesday's practice with a hamstring injury. Analysis: Coates caught his first pass of the season for 12 yards Sunday against the Patriots, but apparently didn't leave the game unscathed, as he's now dealing with a hamstring injury. The Texans hope Coates -- along with rookie Keke Coutee -- to fill the void left by Bruce Ellington (hamstring), though it was Coutee who dominated targets Sunday. Coates caught his lone target during Sunday's 37-34 win over the Colts, picking up a gain of 12 yards. 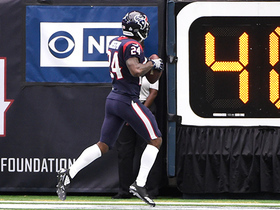 Coates caught his lone target for 12 yards in Houston's Week 4 overtime win against Indianapolis on Sunday. Analysis: Coates returned to active duty after missing two games with a hamstring injury. Even with Bruce Ellington (hamstring) sidelined and Will Fuller (hamstring) leaving Sunday's game, Coates' opportunities were limited, as rookie Keke Coutee (15 targets) emerged as a leading threat. Coates does not carry an injury designation for Sunday's game against the Colts. Analysis: Coates missed two regular-season games due to a lingering hamstring injury, but he appears fully recovered in time for the Texans' Week 4 matchup. The fourth-year wideout will work to earn targets behind DeAndre Hopkins and Will Fuller. Coates (hamstring) is inactive for Sunday's game against the Giants. Analysis: The Texans will be down two of their depth wideouts in Week 3 with rookie Keke Coutee (hamstring) joining Coates on the inactive list. Those two absences leave Vyncint Smith in line for work in four-receiver sets, though he's unlikely to poach many snaps from starting trio DeAndre Hopkins, Will Fuller and Bruce Ellington. Coates (hamstring) is listed as questionable on the Texans' injury report ahead of Sunday's matchup with the Giants. Analysis: Coates was trending in this direction, as he was a limited participant in practice all week. He played through the injury in Week 1, but ultimately sat out last week's loss to the Titans. Final confirmation on his status is not expected until closer to kickoff, but he is just expected to play a depth receiver role if he is indeed given the green light. Coates (hamstring) was a limited participant in Wednesday's practice. Analysis: Coates was limited in practice all last week before being held out of the Texans' Week 2 loss to the Texans with the lingering hamstring injury. With Will Fuller (hamstring) and Keke Coutee (hamstring) also limited to begin the week, the Texans could enter Sunday's game against the Giants thin at receiver. Coates (hamstring) will not play in Sunday's game against the Titans, Aaron Wilson of the Houston Chronicle reports. Analysis: Coates was limited at practice throughout the week. It seemed like he had a shot to suit up Sunday, but that option has ultimately been ruled out. Fellow depth receiver Keke Coutee (hamstring) has also been ruled out, leaving the Texans thin at the position. As a result, Vyncint Smith could see another relatively healthy workload. Coates (hamstring) is questionable to play in Sunday's game against the Titans. Analysis: Coates was a limited participant in practice all week due to an unspecified hamstring injury. With Keke Coutee (hamstring) also uncertain to play, Vyncint Smith could be in store for another significant offensive workload this weekend. Coates was a limited participant at Wednesday's practice due to a hamstring injury. Analysis: Coates was one of three receivers limited by a hamstring -- Will Fuller and Keke Coutee being the others. He is expected to play Week 2 against the Titans, but after playing six snaps on offense last week we don't foresee him making a big splash. Coates (hamstring) is active for Sunday's tilt against the Patriots. Analysis: Coates was limited in practice during the week, and it's unclear if he'll be limited at all in Sunday's game. Will Fuller (hamstring) is out, meaning that Coates could operate as the No. 3 wide receiver and see some extra action against New England. Coates (hamstring) was limited during Friday's practice and is listed as questionable for Sunday's game against the Patriots. Analysis: The Texans could be especially thin at wide receiver, since Coates, Will Fuller and Keke Coutee are all questionable with hamstring injuries. That leaves DeAndre Hopkins, Bruce Ellington and Vyncint Smith as the only healthy wideouts. Coates (hamstring) was a limited participant in Thursday's practice, Aaron Wilson of the Houston Chronicle reports. Analysis: The severity of Coates' injury is unknown, so the 2015 third-round pick should be considered day-to-day until more information is disclosed. Coates made the Texans' 53-man roster largely due to his abilities as a returner and depth receiver, so the Texans would be most impacted on special teams if Coates were to miss Sunday's season opener against the Patriots. Coates secured one of two targets for 32 yards in the Texans' 21-20 preseason loss to the Rams on Saturday. He also returned one kickoff for 24 yards. Coates (concussion) returned to practice Wednesday, Aaron Wilson of the Houston Chronicle reports. Analysis: Coates could use the final two weeks of the preseason to try to carve out a bigger role with the offense. As it currently stands, Coates is battling Braxton Miller for the fourth wideout role. These final few weeks should provide Coates with plenty of opportunity to make his case for a roster spot. Coates suffered a concussion and will not return to Saturday's preseason game against the 49ers. He caught three passes for 32 yards and returned one kickoff for 24 yards before the injury. Analysis: Coates is expected to make the team as a fourth or fifth wideout, though his primary role will be on special teams. Head coach Bill O'Brien likes all of Coates' physical attributes and feels the wide receiver can help on special teams, Aaron Wilson of the Houston Chronicle reports. "Good work ethic, good speed, good size," O'Brien said. "(Can) help us, hopefully, on special teams and then does some decent stuff on offense." Analysis: This isn't the first time during the offseason we've heard Coates' name in the same sentence with special teams. The former Steeler and Brown has averaged 13 snaps per game on special teams over the last two seasons, only a handful of which came as a return man, so one can easily visualize his role with the Texans if he makes the team. The Texans have claimed Coates off waivers, Jeremy Fowler of ESPN.com reports. The Browns have parted ways with Coates, Scott Petrak of the Elyria Chronicle-Telegram reports. Analysis: Pittsburgh's 2015 third-rounder ended up hauling in just six passes for 70 yards in 12 games for the Browns in 2017. He'll look for another fresh start elsewhere, though the 24 year-old wideout has much to prove before re-emerging on the fantasy radar. Coates, who played just eight offensive snaps without a target during Cleveland's Week 17 loss to the Steelers, finished the season with six receptions for 70 yards. Analysis: The Browns traded for Coates right before the season kicked off in hopes that the 24-year-old would provide significant depth to a relatively weak receiving corps. However, injuries and his inability to be productive during his limited time on the field completely wiped away any optimism. Coates will enter the last year of his rookie contract in 2018, though his future with the Browns is unclear. Coates (shoulder) won't carry an injury designation into Sunday's game against the Steelers, Nate Ulrich of the Akron Beacon Journal reports. Analysis: Coates started the week as a limited participant, but was able to put in a full practice session Friday to avoid the questionable tag. The 24-year-old is unlikely to see an expanded role in Sunday's season finale with the rest of the Browns' receiving corps currently in good health. Coates (shoulder) was a limited participant during Wednesday's practice, Nate Ulrich of the Akron Beacon Journal reports. Analysis: Though he was on the field for just four offensive snaps in Sunday's loss to the Bears, Coates seemingly injured his shoulder at some point in the contest. The 24-year-old has six receptions this season and is a non-factor in all fantasy formats. Coates brought in his only target for eight yards during Sunday's 27-10 loss to the Ravens. Analysis: Coates was only on the field for six plays and managed to grab his sixth reception of the season. Originally thought to play a big role in Cleveland's offense after being traded from the Steelers, the 24-year-old wideout has been virtually nonexistent for coach Hue Jackson. He's struggled with injuries throughout the year and hasn't been able to impress when on the field. Coates failed to play a snap during Sunday's 27-21 loss to the Packers. Analysis: Though the wideout was active for the first time since Week 11, Coates was relegated to sideline duty and finished the game without playing a single snap. Even with the Browns waiving Kenny Britt, Coates is still buried on the depth chart, and that doesn't figure to change in the near future. Coates (knee/ankle) is listed as active for Sunday's home matchup against the Packers. Analysis: Coates will suit up despite a week of limited practices but is in line to take a back seat in the passing game to Corey Coleman and Josh Gordon, even following the waiving of wideout Kenny Britt. Coates hasn't taken the field since Week 11, when he was limited to special teams work. Coates (ankle, knee) is listed as questionable for Sunday's game against the Packers, Nate Ulrich of the Akron Beacon Journal reports. Analysis: Coates has missed the last two games with these injuries, but he wasn't much of a ball hog before the injury, posting just five receptions for 62 yards through eight games. With WR Josh Gordon back in the fold, Coates will likely become more of an afterthought for QB DeShone Kizer. Coates (ankle/knee) was limited at practice Wednesday. Analysis: With Corey Coleman and Josh Gordon having returned from injury and suspension, respectively, in recent weeks, Coates' chances of making an impact in the Browns' passing game have all but evaporated. If he gains clearance to play Sunday against the Packers, Coates seems likely to see more snaps on special teams than offense. Coates (ankle/knee) has been ruled out for Sunday's game against the Chargers. Analysis: Coates' absence will affect the Browns' depth at wideout, but the return of Josh Gordon from suspension more than makes up for it. With Gordon presenting a more formidable downfield threat than Coates, who has caught only five passes for 62 yards this season, it seems plausible that Coates won't see much burn on offense once he shakes off the injuries. Coates (ankle/knee) sat out Thursday's practice. Analysis: Coates is on track to miss his second game in as many weeks, as he hasn't been able to practice since injuring his ankle and knee on Nov. 19. The 24-year-old has just five receptions for 62 yards on the year. Coates (ankle/knee) didn't practice Wednesday, Nate Ulrich of the Akron Beacon Journal reports. Analysis: With Corey Coleman back in the team's wideout mix and Josh Gordon (suspension) poised to return to action Sunday against the Chargers, Coates' Week 13 availability is of more import to the Browns' depth at wideout than it is to fantasy players. Coates (ankle, knee) has been ruled out for Sunday's game against the Bengals, Nate Ulrich of the Akron Beacon Journal reports. Analysis: Having recorded just five catches for 62 yards in eight games this season, Coates' impact in the Cleveland offense has been minimal thus far. With Corey Coleman back in the team's wideout mix and Josh Gordon (suspension) having resumed practicing, Coates' path to fantasy lineup consideration is cloudy, even when he is healthy. Coates (ankle, knee) didn't practice Wednesday, Nate Ulrich of the Akron Beacon Journal reports. Analysis: Per the report, Coates was sporting a walking boot on his left leg Wednesday, which doesn't bode especially well for his chances of suiting up Sunday against the Bengals. The 24-year-old has logged just five catches for 62 yards in eight games this season and with the Browns having welcomed Corey Coleman back in Week 11 and Josh Gordon (suspension) having resumed practicing, Coates' path to steady targets down the stretch isn't clear. Coates (knee, ankle) will not return to Sunday's game against the Jaguars, Mary Kay Cabot of Cleveland.com reports. Analysis: Coates sustained the injuries early in Sunday's game and didn't seemed poised for a return. The 24-year-old only has five receptions on the season, and the Browns offense is unlikely to be majorly affected by his absence. Coates is questionable to return to Sunday's game against the Jaguars with knee and ankle injuries, Mary Kay Cabot of Cleveland.com reports. Analysis: Coates was helped off the field while putting minimal weight on his injured leg before heading to the locker room in the first quarter. It seems unlikely for him to return given how he exited the field, but the 24-year-old has yet to be ruled out of Sunday's game. Coates caught both of his targets for 38 yards during Sunday's 38-24 loss to the Lions. 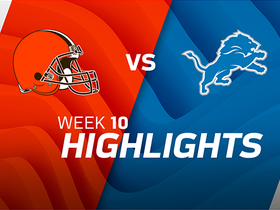 Analysis: On Cleveland's first play from scrimmage, DeShone Kizer (ribs) launched a deep throw down the left sideline and connected with Coates for a 38-yard gain. 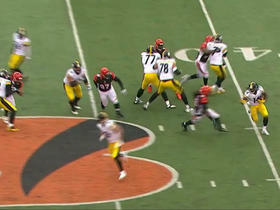 That, however, was the highlight of Coates' day, as his only other reception failed to gain any yards. The 24-year-old was on the field for just 17 snaps but still proved he has ability as a deep threat. 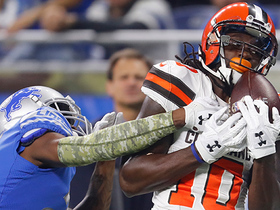 Cleveland Browns wide receiver Sammie Coates hauls in 38-yard bomb vs. the Detroit Lions in Week 10 of the 2017 NFL season. Pittsburgh Steelers wide receiver Sammie Coates goes for 15 yards on end-around. 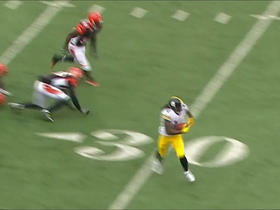 Pittsburgh Steelers wide receiver Sammie Coates takes kick return for 44 yards. 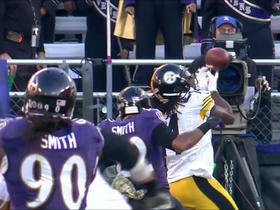 Steelers wide receiver Sammie Coats drops a pass from quarterback Ben Roethlisberger in the end zone. 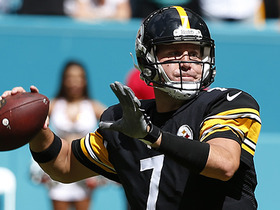 Steelers QB Ben Roethlisberger leaves the game with an injury against the Dolphins. 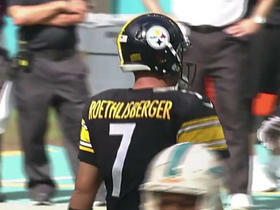 Miami Dolphins safety Isa Abdul-Quddus picks off Pittsburgh Steelers quarterback Ben Roethlisberger. 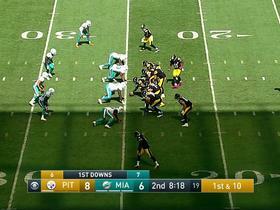 Miami Dolphins safety Reshad Jones picks off Steelers quarterback Ben Roethlisberger. 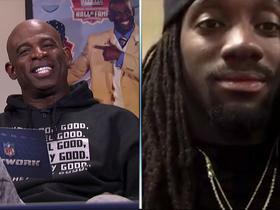 NFL Network's Deion Sanders chats with Pittsburgh Steelers wide receiver Sammie Coates about his productive day against the New York Jets.